Often churches find themselves ill-equipped to welcome youth with mental and physical disabilities and their families. When we look around our churches on Sunday mornings or at other church events we don't often see special needs youth participating. Sensing that their children don't "belong", families of special needs youth either stay away from church events or adapt by attending church services in shifts, causing their special needs youth to remain "on the outside" and lessening their own experiences of church life. When the church does not have a plan in place to help them, special needs youth and their families can drift to the periphery of church life. This ministry is designed to help special needs youth grow in their Christian faith as fully participating members in their church. The ministry aims to support special needs youth in all aspects of their spiritual growth including: worshipping, learning about Scripture, experiencing fellowship, praying and serving others. The ministry strives to have special needs youth connected as much as possible to other members in their church as they seek to grow in their spiritual lives (rather than providing a program that is distinctly separate from the rest of church life). These goals are accomplished by developing an Individual Spiritual Plan for every youth; after the Spiritual Plan is developed, the youth is surrounded by a group of special friends who help to carry out the plan. The Special Needs Ministry Handbook described below provides the practical steps and methods to implement this ministry in your congregation. Anyone sensing God leading them to reach out to special needs youth and their families. The Handbook is 35 pages long and may be downloaded as a PDF file. We request a donation of $5. Click to VIEW the table of contents and an excerpt from the Handbook. 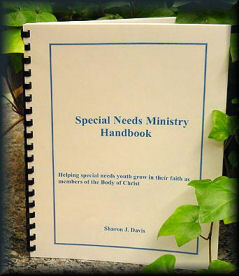 Click to DOWNLOAD the PDF of the Special Needs Ministry Handbook.